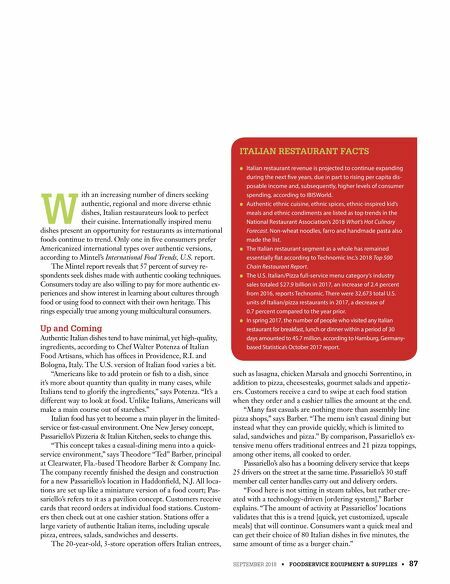 SEPTEMBER 2018 • FOODSERVICE EQUIPMENT & SUPPLIES • 87 W ith an increasing number of diners seeking authentic, regional and more diverse ethnic dishes, Italian restaurateurs look to perfect their cuisine. Internationally inspired menu dishes present an opportunity for restaurants as international foods continue to trend. Only one in five consumers prefer Americanized international types over authentic versions, according to Mintel's International Food Trends, U.S. report. The Mintel report reveals that 57 percent of survey re- spondents seek dishes made with authentic cooking techniques. Consumers today are also willing to pay for more authentic ex- periences and show interest in learning about cultures through food or using food to connect with their own heritage. This rings especially true among young multicultural consumers. Up and Coming Authentic Italian dishes tend to have minimal, yet high-quality, ingredients, according to Chef Walter Potenza of Italian Food Artisans, which has offices in Providence, R.I. and Bologna, Italy. The U.S. version of Italian food varies a bit. 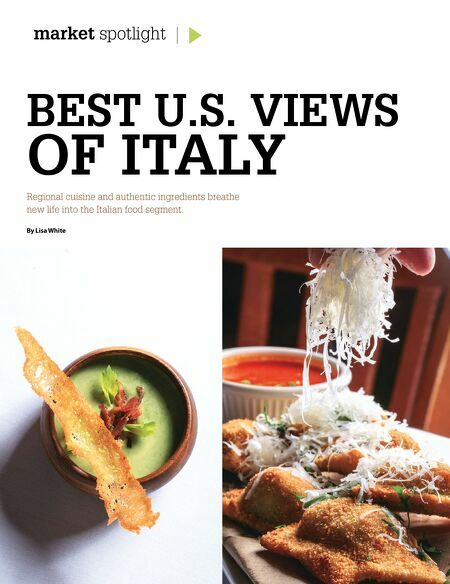 "Americans like to add protein or fish to a dish, since it's more about quantity than quality in many cases, while Italians tend to glorify the ingredients," says Potenza. "It's a different way to look at food. Unlike Italians, Americans will make a main course out of starches." Italian food has yet to become a main player in the limited- service or fast-casual environment. One New Jersey concept, Passariello's Pizzeria & Italian Kitchen, seeks to change this. "This concept takes a casual-dining menu into a quick- service environment," says Theodore "Ted" Barber, principal at Clearwater, Fla.-based Theodore Barber & Company Inc. The company recently finished the design and construction for a new Passariello's location in Haddonfield, N.J. All loca- tions are set up like a miniature version of a food court; Pas- sariello's refers to it as a pavilion concept. Customers receive cards that record orders at individual food stations. Custom- ers then check out at one cashier station. Stations offer a large variety of authentic Italian items, including upscale pizza, entrees, salads, sandwiches and desserts. The 20-year-old, 3-store operation offers Italian entrees, such as lasagna, chicken Marsala and gnocchi Sorrentino, in addition to pizza, cheesesteaks, gourmet salads and appetiz- ers. Customers receive a card to swipe at each food station when they order and a cashier tallies the amount at the end. "Many fast casuals are nothing more than assembly line pizza shops," says Barber. "The menu isn't casual dining but instead what they can provide quickly, which is limited to salad, sandwiches and pizza." By comparison, Passariello's ex- tensive menu offers traditional entrees and 21 pizza toppings, among other items, all cooked to order. Passariello's also has a booming delivery service that keeps 25 drivers on the street at the same time. Passariello's 30 staff member call center handles carry out and delivery orders. "Food here is not sitting in steam tables, but rather cre- ated with a technology-driven [ordering system]," Barber explains. "The amount of activity at Passariellos' locations validates that this is a trend [quick, yet customized, upscale meals] that will continue. Consumers want a quick meal and can get their choice of 80 Italian dishes in five minutes, the same amount of time as a burger chain." ITALIAN RESTAURANT FACTS ● Italian restaurant revenue is projected to continue expanding during the next five years, due in part to rising per capita dis- posable income and, subsequently, higher levels of consumer spending, according to IBISWorld. ● Authentic ethnic cuisine, ethnic spices, ethnic-inspired kid's meals and ethnic condiments are listed as top trends in the National Restaurant Association's 2018 What's Hot Culinary Forecast. Non-wheat noodles, farro and handmade pasta also made the list. ● The Italian restaurant segment as a whole has remained essentially flat according to Technomic Inc.'s 2018 Top 500 Chain Restaurant Report. ● The U.S. Italian/Pizza full-service menu category's industry sales totaled $27.9 billion in 2017, an increase of 2.4 percent from 2016, reports Technomic. There were 32,673 total U.S. units of Italian/pizza restaurants in 2017, a decrease of 0.7 percent compared to the year prior. ● In spring 2017, the number of people who visited any Italian restaurant for breakfast, lunch or dinner within a period of 30 days amounted to 45.7 million, according to Hamburg, Germany- based Statistica's October 2017 report.